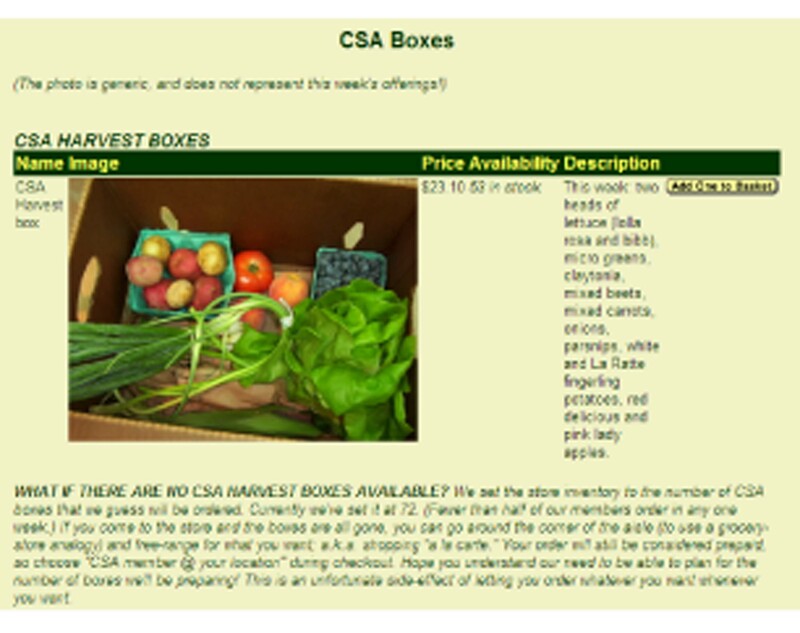 I just placed my second order for a CSA Harvest Box, eggs, and cheese at Star Hollow Farm’s Online Market. I’m really excited about eating locally produced foods again. With all my work related travel I have missed quite a few Saturday deliveries and the Sunday Dupont Circle Farmers Market. I felt so guilty last weekend buying zucchini, yellow squash, bell peppers, avocadoes and other summer vegetables at Whole Foods…in the middle of winter. Well, no more unseasonal veggies for me. 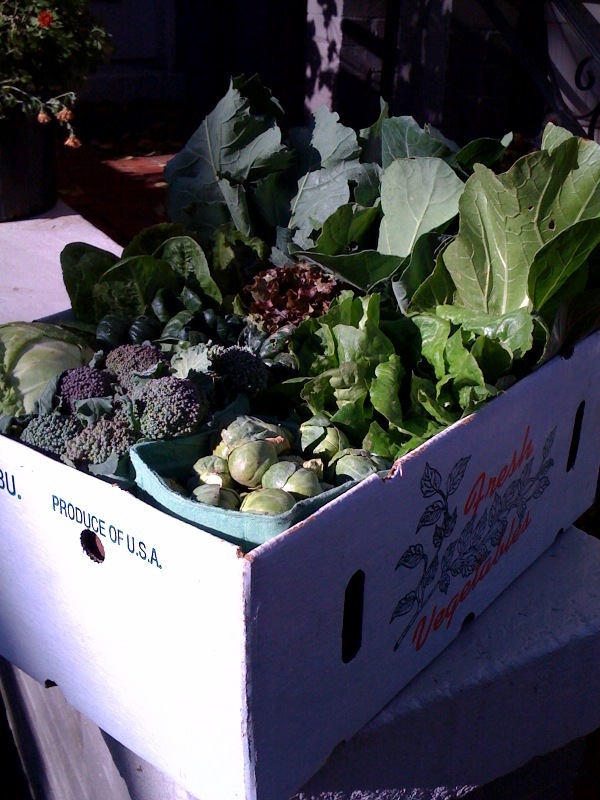 For more information about Star Hollow Farm, check out their blog: Star Hollow Farm CSA Blog. My husband and I just joined our first ever online CSA (community supported agriculture). Last December while picking up our last share of Licking Creek Bend Farm‘s CSA, I noticed an advertisement for Star Hollow Farm’s Online Farmer’s Market & CSA. Growers Randy and Chris, a husband and wife team in Three Springs, Pennsylvania, started this innovative business plan in 2003. During the winter, Star Hollow Farm partners with Tuscarora Organic Growers Co-Op, several local orchards and dairies, and other family farms to provide a variety of high quality organic and conventional, locally grown and raised, products for Washington DC residents. CSA members pay $300 up front in January, which opens up a “debit” account on the online system. Every other week, beginning at 7am on Wednesday morning through 7am on Thursday, CSA members can shop at Star Hollow Farm’s Online Store. Members have the option of choosing the traditional share (a box of preassigned produce) or purchasing things a la carte or both. 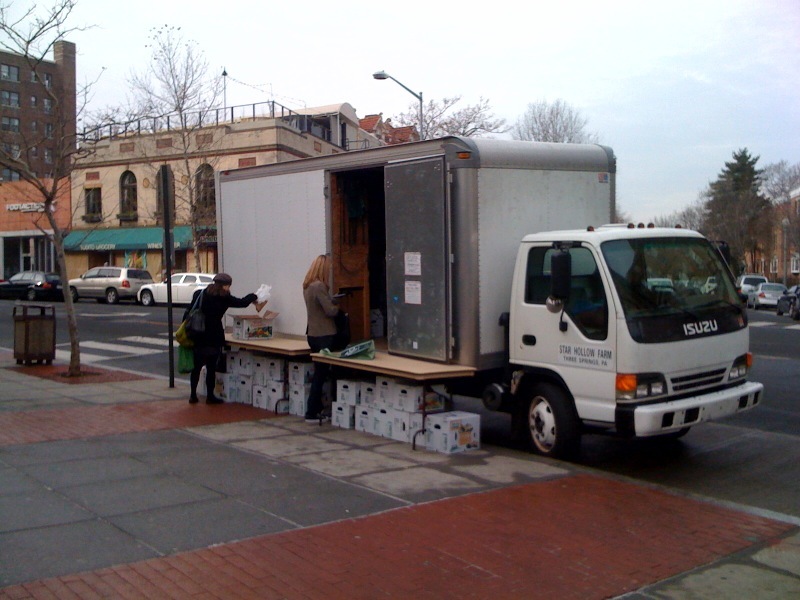 After all orders are submitted, Star Hollow Farm delivers the produce on Saturday mornings between 10am and 1pm to the Adams Morgan Farmers’ Market at 18th St and Columbia Rd in front of SunTrust. This innovative CSA model provides financial support up front for the farmer and flexibility to the customer. All this cost $30.50 – far less than what I would have paid at Whole Foods, the Dupont Circle Farmers’ Market, or any other store in the Washington DC area for the quality and quantity. This is the very last CSA share for the year and winter. How sad! It’s our last week of our CSA. How sad!!! I just spoke with Farmer Mike and he said there may be a possibility to extend our share for a few weeks. It pays to know your farmer! On our walk home from picking up our CSA share, Farmer Mike told us that they still have a lot of winter greens, lettuce, and other vegetables to pick – thanks to plastic tarps and extending the growing season. 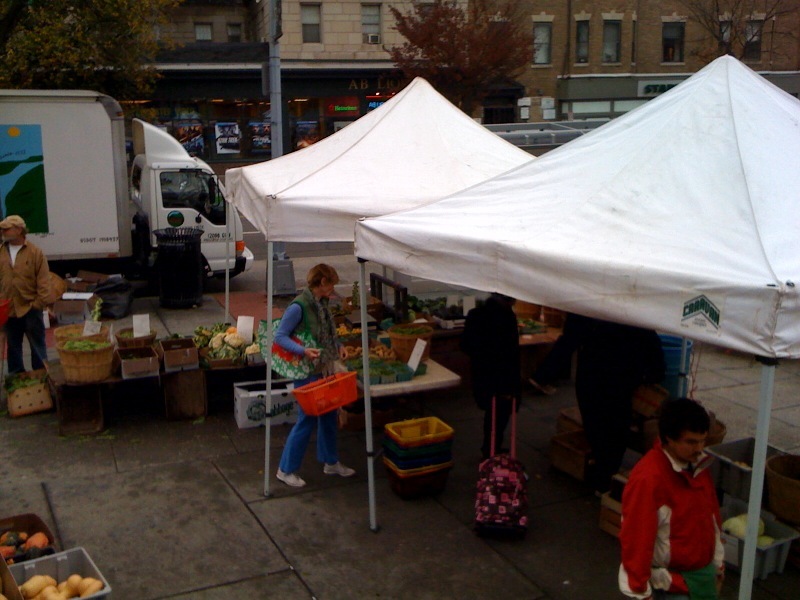 Don’t want to get too excited, but hopefully we’ll be able to get a couple more weeks of fabulous produce. I love not knowing what we’ll get; the challenge of finding inventive recipes; and getting to chat with our farmer every week. Excellent served with Sweet Potato Quesadillas. In the toaster oven (or oven) roast tomatillos, jalapeno peppers, and garlic: coat small baking sheet covered with foil with cooking spray, add halved vegetables, coat with a little more cooking spray. Broil in toaster oven for about 5-10 minutes until slightly brown and vegetables are cooked through. 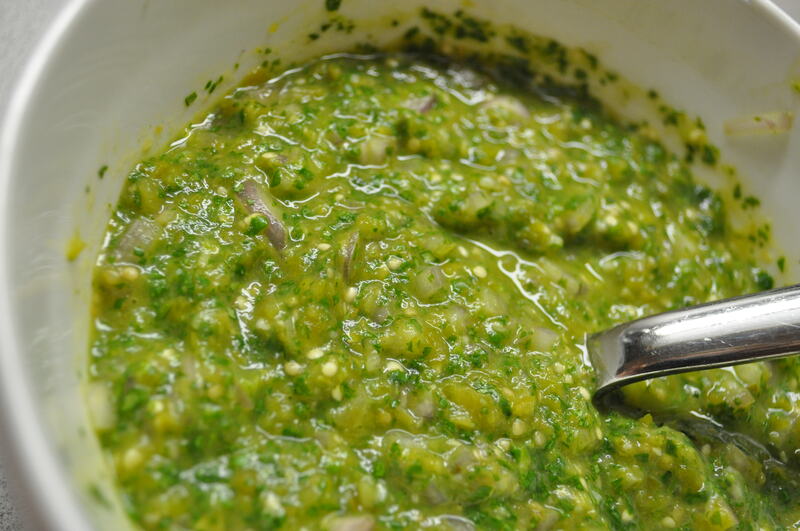 In a food processor, combine roasted vegetables, cilantro through salt. Blend. Stir in shallots and refrigerate until ready to use. Can be served warm or cold. Last week I didn’t exactly have a meal plan because I was traveling. Basically we just ate a bunch of leftovers (made a huge pot of Moroccan Chickpea Curry with Couscous) and gave some of our CSA veggies to friends who watched our dog. Greg and I rode our bikes down to Adam’s Morgan to pick up the CSA share at the farmer’s market. We had a great conversation with Michael about his farm operation, food systems, capitalism, obesity and the built environment, and a whole slew of other interesting things. I mentioned this blog to him, and he was really excited about it. It was very stimulating conversation. I also picked up 4 conventional beets, which I’m going to use to make borsch. Yippee! I am finally a CSA member again. 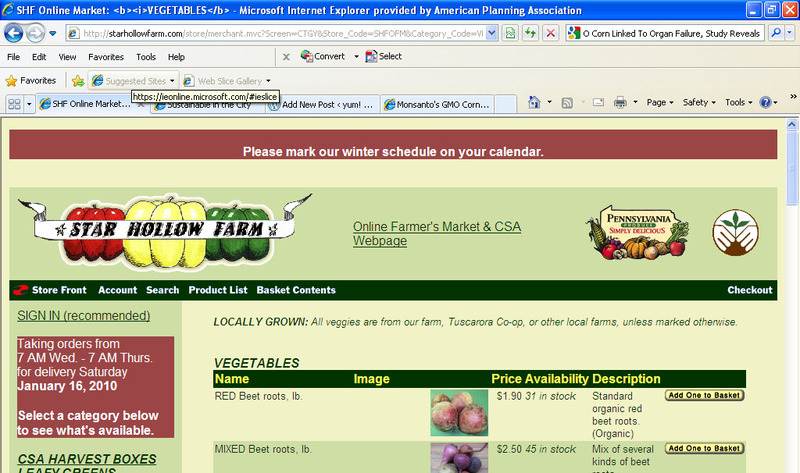 I was so disppointed to find out that Potomac Vegetable Farms doesn’t deliver their fall share to DC residents. 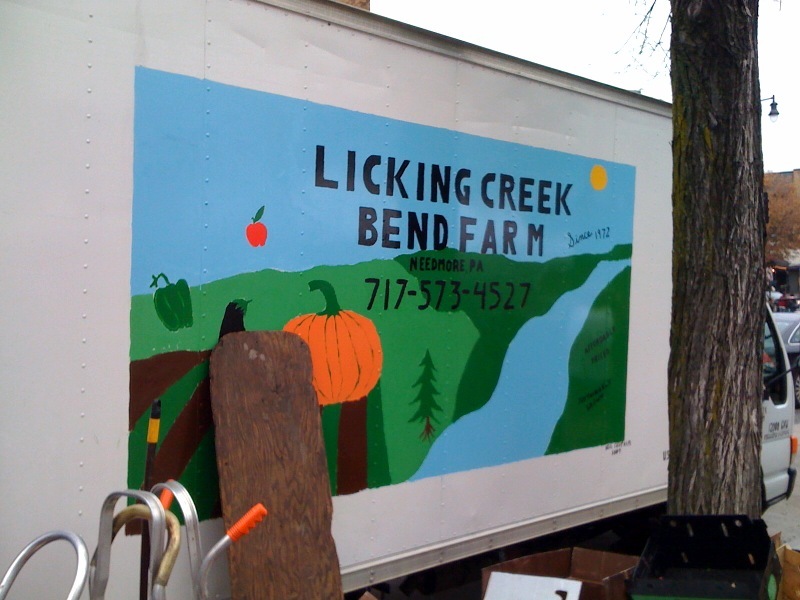 But, luckily Rex found out about another CSA – Licking Creek Bend Farm – from a work colleague. The Licking Creek Bend Farm CSA was able to squeeze us (and our friends John and Greg) into the fall share. So for the next 9 weeks we’ll each be getting a fabulous box of lovely fall produce. Greg and I decided to do some additional shopping at the 3 vendor Adams Morgan Farmers’ Market. I was so shocked at the prices. Only $1.29/lb for local apples, sustainably grown (versus the $2.49/lb I paid last week at the Dupont Circle FRESHFarms Market) at Licking Creek Bend Farm’s produce stand. I spoke with Michael Tabor a bit to discover that a lot of his customers are WIC and SNAP food benefit recipients. He took me behind the cashier area and held up a box, full of WIC and SNAP vouchers. For fabulous produce at such low prices, you really can’t beat it. So, to get Rex and I through the week – I picked up a few more apples (perhaps I’ll make an apple crisp or other dish) and some sweet snap peas (fabulous lunch snack).